Remove wallpaper. 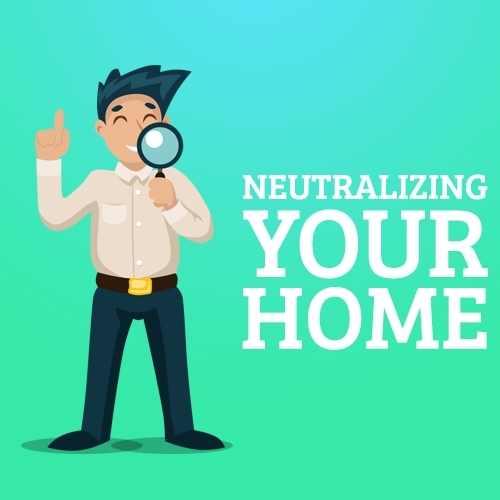 It can be a rigorous process to remove this and may turn off homebuyers if it’s not neutral. Avoid bright colors. These tend to be an acquired taste and will remind homebuyers of the work they may have to do before finally settling into the home. Avoid dark color. Darker colors create an optical illusion that makes a space appear smaller. Neutral colors for staging your home are best, as they make rooms appear larger than they are. Adding accents of color, like photographs or paintings, against a neutral background can make a room seem modern and appealing (think of art galleries). They also are easier to change in the future, which homebuyers will appreciate when it comes time to move in. With carpeting and accessories, think of using complementary colors (i.e. blue and orange, purple and yellow, red and green), following the rule the 80% of the predominate color should be a neutral, with 20% being the appealing complementary color. Bear in mind that lighting changes the color you’ve selected, you can use the same hue for incandescent lights and natural lighting, only to get different results. This can help save money and emphasize your home’s lighting variations. Make sure that your colors flow from one another. Earth tones and neutrals work best, as we’re accustomed to these colors from nature. Having a hot pink go to a beige is off-putting. Consult your real estate agent. Chances are that this person has had experience successfully closing homes, so they intuitively know what works and what doesn’t. Ask your friends to do a walk-around. Request that they give you an honest opinion, whether it’s odors, color schemes, or any other feature that could be jarring to the eye. Don’t take their criticism personal. The goal is to sell the home, not save face! Look at other homes in your area that are for sale. Take notes on how the homes are arranged and what the owners have down to make the home seem inviting. Very often, homes in your local area may have been built in the same style, so you can steal some of their ideas.